An AR-22 engine, being used for a developmental reusable spacecraft, is seen in Stennis, Miss., Monday, July 2, 2018. Triggering a massive cloud of vapor and a roar, officials on Monday test fired the rocket engine designed to be part of a reusable spacecraft that can launch into space repeatedly with a quick turnaround time. Triggering a massive cloud of vapor and a roar, officials on Monday test fired a rocket engine designed to be part of a reusable spacecraft that can launch into space repeatedly with a quick turnaround time. 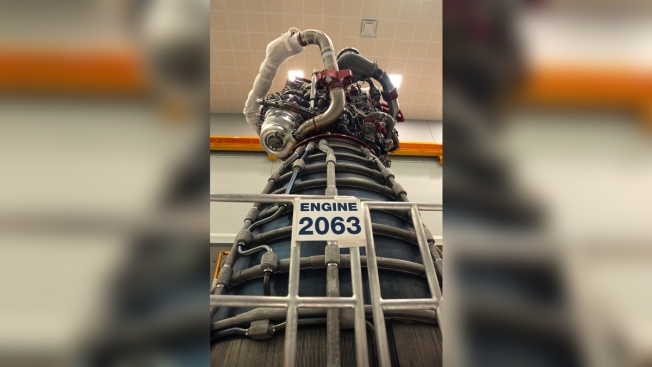 The AR-22 engine will power an experimental spacecraft — called the Phantom Express — that's a collaboration between the Defense Advanced Research Projects Agency, Boeing and Aerojet Rocketdyne. Engineers are currently testing the engine over a 10-day period by firing it up for 100 seconds and then doing it again 24 hours later. Monday's was the sixth of what is anticipated to be 10 test fires. Tom Martin from Aerojet Rocketdyne said Monday's test at Stennis Space Center in Mississippi was "awesome" to see although a bit "boring" because everything went exactly as planned. "The action starts when the engine shuts down. The whole idea is, 'How do we get this engine ready to go in 24 hours?'" he said. "Nothing went wrong. The data is exactly what we expected. The engine did exactly what we were expecting it to." A small rocket from Japanese startup Interstellar Technologies crashed just seconds after liftoff in Hokkaido, Japan, on June 30, 2018. This was the second failed launch from the company. The goal is to create a new type of spacecraft that can launch into low Earth orbit on short-notice — days instead of months or years — and cost less than traditional space programs. The spacecraft would be unmanned and roughly about the size of a business jet. It would take off vertically and once it reaches a certain altitude a second stage would be released that could then deploy a satellite to orbit. The first stage would glide back to earth and land horizontally on a runway like an airplane. It would then be able to quickly launch again for another flight. The craft could carry payloads between 3,000 and 5,000 pounds, said Steve Johnston, from Boeing. Historically, launching satellites into space has been an expensive endeavor that requires a lot of lead time, said Scott Wierzbanowski, from DARPA. "What we wanted to do at DARPA was change that paradigm. We wanted to enable tactical use of space, to be able to make it more affordable, to reduce times to space," Wierzbanowski said. "We want to show that you can have a reusable space system and use it on a daily basis." One of the key challenges is drying the moisture in the engine that's created when the fuel — liquid hydrogen and liquid oxygen — combusts, said Jeff Haynes, from Aerojet. Once the engine has been test fired, they run high-pressure air through the system for hours to dry it out. 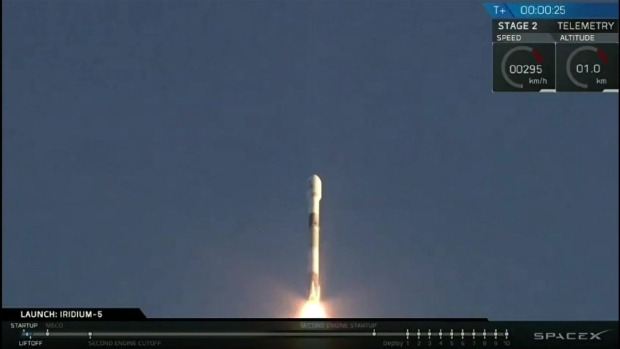 A SpaceX rocket used for a previous mission was sent back into space, this time with 10 communications satellites aboard. The rocket launched Friday, March 30, 2018, from Vandenberg Air Force Base in California. "It generates a whole bunch of moisture and water within the engine," he said. With the space shuttle program, that moisture was also an issue but the drying only had to happen over weeks or months. "We have to show that we can do it in about eight hours, maybe six hours." Wierzbanowski said the Phantom Express actually uses many of the capabilities and technologies from the space shuttle — specifically the main engine and thermal protection system.